Many people already agree that lipless crankbaits are the best fishing lure for catching bass. Empirically speaking, many people have tried it successfully for this purpose. They have benefits such as their size which allows them to cover distances of over a mile long. Also, their easiness of use is also evident. They can be worked in many ways such as across the top or the bottom, etc. Additionally, they feature a distinct sound and vibration that works like a dinner bell for the fish.That being said, it is not enough to know that these types of crankbaits are excellent; you should also know which one of them is the best if you want to optimize your chances of success in this endeavor. How To Choose The Best Lipless Crankbaits? It is very hard to pinpoint which is the single best lipless crankbait in the market. There are many types of lipless crankbaits each with its unique features even though they can all be labeled as lipless crankbaits. If You Are Looking For Crankbaits for bass fishing Go Here Right Away. Use double loop knot with 8-10 lb test line. Lipless Crank bait, 3", 3/4 oz. Lure design allows bait to swim to the bottom on its noes. Lure has blood colored gills as its main feature. It is not by chance that the Xcalibur Rattle Bait is the first on the list. It features a very loud rattle along with a good vibrating motion which makes it very suitable for its purpose. This one is very similar to the Xcalibur Rattle Bait regarding body design. The main difference between the two is the sound. Instead of delivering a super loud sound, this lipless crankbait has a rhythmic sound that is achieved by its components, i.e. tungsten and lead. Whether it is the Rattle Bait or the One Kno﻿﻿﻿﻿﻿﻿﻿﻿﻿cker, rest assure that you are picking one of the best lipless crankbaits out there. The Strike King Red Eye Shad Bait is currently one of the most sold lipless crankbaits products. It is available in forty-five different patterns which means you will definitely find one that "lures" you the most. If you plan to use the yo-yo retrieve way of catching fish in your next angler's session, this one is for you. In the yo-yo retrieve, you will be pulling and dropping the rod so the lure either flutters or falls. This movement imitates that of a wounded fish. This particular lipless crankbait falls in a very precise and controlled manner making it easy for fish to bite on it. The design of the Spro Aruku Shad 75 allows it to swim to the bottom with its nose. This allows it to avoid getting stuck with water plants. It has a very noisy rattle also. It is one of the attention-grabbing designs for fish in general. Many people love it after having tried it. The Matzuo Ikari is one of the newest lipless crankbaits out there. Ikari can be translated as "anger" which may be the reason why bass may be angry at them after having been caught! This lure has blood colored gills as its main feature. It looks very realistic, and it resembles what it seems to be a harmed baitfish. It is available in nine colors, and it has BBs made up of stainless steel which serves to give that deadly vibration bass feel a compulsive urge to go for it. The LIVETARGET Yearling Baitball is designed to catch big bass. This lipless crankbait doesn't have a modest size which is the reason why many fishermen choose it when they want to catch fish that have above-average sizes- Unlike most lipless crankbaits out there, the LIVETAR﻿﻿﻿GET looks like three crankbaits put together. Thus, a fish will think it will be getting a big meal if it bites it. Needless to say, this can be one of the best lipless crankbaits in existence. This lipless crankbait works by giving bass exactly what they want. Biology and common sense have told us that bass love pumpkin seeds and bluegill. The finish of the ﻿﻿LIVETARGET﻿﻿ Pumpkin Seed Rattlebait looks just like a pumpkin seed, hence, its name. There are two patterns available for you to choose, i.e. the pumpkin seed and the bluegill pattern. Also, you can either pick a flashy or a matte version of it. Additionally, it has a relatively noisy chamber that's meant to attract fish. This lipless crankbait is one of the most special of them all. The Rapala Clacking Rap may be easily be considered by some as the best lipless crankbait in the market for two reasons. First of all, it has a superior finish. When using lipless crankbaits on a regular basis, the paint finish will start to wear off. Whether it is due to bumping against timber or simply by the mere action of catching a fish, the lure can start to lose its appeal. In some cases, the paint doesn't only fade away, but it also starts chipping in some parts. This, of course, will affect the effectiveness of your lure in the long run. The ﻿﻿Rapala ﻿﻿﻿Clacking ﻿﻿﻿Rap﻿﻿is made in such a way so as to minimize this from happening. It does so by having a hard transparent plastic body covering the paint. This lipless crankbait is made to last for long and is efficient throughout its lifespan. The second feature that makes it stand up is a metal circle on one of its sides. This circle is a cylinder that acts like a "magnet" by delivering a clacking sound and vibration that is irresistible for bass. There isn't a one-size-fits-all answer to this question. As we have seen in the list above, each of the lipless crankbaits mentioned has its own unique features that make them stand out of the rest. Plus, you should also take into account the place where you plan to fish and the fishing technique you want to use. 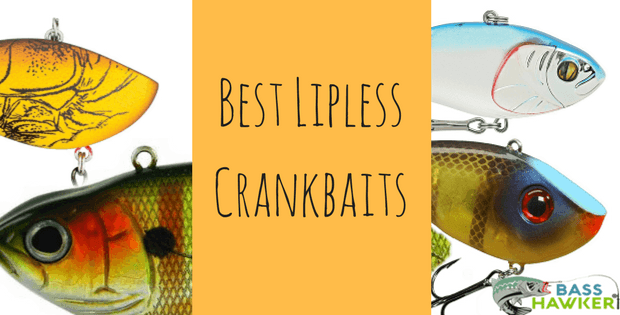 The best way to choose the best lipless crankbaits is to try a few of them yourself. Once you have experimented with some of them for a reasonable period, you can choose to stick with the one that gives you the most benefits of them all.